Kids in school buses, children on foot and bikes, harried parents in cars: Back-to-school days bring congestion—and an increase in potential hazards. 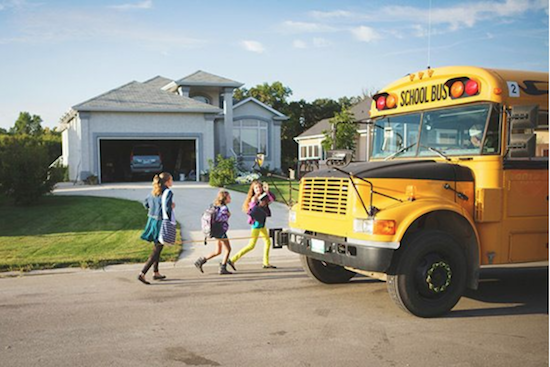 "This can be a dangerous time because children—as well as drivers—are adjusting to back-to-school routines," says Alex Epstein, director of transportation safety for the National Safety Council (NSC). Fortunately, a few key tips can help improve safety for everyone. Here's what Epstein recommends that drivers be aware of, as well as some reminders for parents to share with their kids. Slow down and drive cautiously. Don't double park; it blocks visibility for other children and vehicles. When flashers are blinking, stop and yield to pedestrians crossing the crosswalk or intersection. Be prepared for kids to appear in unexpected places, like from between parked cars; if they're on bikes, prepare for them to turn in front of you without looking or signaling. If you need to use your phone, be sure you're pulled over safely. Watch for kids walking while looking at their phones. One study found that a full 20% of high school students cross the street while distracted. If possible, carpool to reduce the number of cars at school. Don't ever block a crosswalk; it forces pedestrians to go around you and could put them in the path of moving traffic. Most of the children who lose their lives in bus-related incidents are four to seven years old and on foot, according to the NSC. They're hit by the bus or by a motorist passing a bus that's stopped to load or unload children—something that's illegal in all 50 states. If you're driving behind a school bus, allow a greater following distance than if you were driving behind a car—at least three car lengths. Stay alert for flashing lights on a bus, which warn drivers of an impending stop. Treat yellow flashing lights the same as a yellow stop light, and decrease your speed. Stop when you see red flashing lights. The area 10 feet around a school bus is the most dangerous for children; stop far enough away to allow them space to safely enter and exit the bus. Take your time and pay attention every time you get on and off the bus. If a hand railing is available, use it. Always wait for the bus at the spot where it arrives. And wait until the bus is completely stopped—with its stop arm extended-—before you approach to board or stand to exit. Never cross in front of the bus. If you must, walk at least 10 feet in front of it and make sure any drivers can see you. Make eye contact and wait for them to wave you on before crossing. Don't walk to school with headphones in your ears or while looking at your phone. Walk on the sidewalk; if there's no sidewalk and you must walk in the street, walk facing traffic. Before crossing the street, stop and look left, right, and left again to see if cars are coming. Always cross the street at crosswalks. If no crosswalk is available, cross at intersections; never in the middle. Remember that there's safety—and visibility—in numbers. Whenever possible, walk in groups rather than alone. If a stranger approaches you and offers you a ride home, don't answer—run away. Head into a store or restaurant if you're not near a safe spot like your school. And if you feel like you're in danger, yell for help. Read more life-saving pedestrian safety tips. Always wear bright-colored clothing and a helmet that's fitted and secured properly. Ride single file on the right side of the road; come to a complete stop before crossing streets, and walk the bike across. Read more bicycle safety tips.